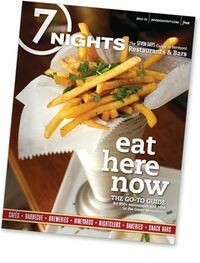 Pick up the latest edition of 7 Nights today at more than 600 locations around the state. Hot of the presses, the annual guide to Vermont restaurants and bars compiles the most comprehensive list of eateries in the state. Browse locations by cuisine type, region and cost. Also, get restaurant recommendations - in eleven regions- from Seven Days food writers Corin Hirsch and Alice Levitt. Want to have your say? Look-up, rate and review your favorite restaurants online.